As the 9th largest city in the United States, Dallas is a major metropolis bustling with activity. You'll never be bored in this city with its brand new arena built for the Dallas Cowboys, the arts district in northern downtown with many art venues, all four major sports (basketball, football, baseball, and ice hockey) played in Dallas or its surrounding metro area, and many other events held constantly throughout the city. Dallas was one of the cities invited to bid on hosting the 2014 Summer Olympic Games. If you do decide to get away, Dallas-Fort Worth International Airport is a major hub for American Airlines and has connections both overseas and domestically to almost anywhere you'd want to go. Only in cities do you find hi-rise apartments and condos, co-ops, lofts, to name several types. Mixed use projects with residential, retail and office allows one to walk to a nice restaurants for dinner or walk/bike to your office. Cities contain many levels of homes, from some of the nicest most upscale luxury residences anywhere to government assisted apartment communities. Cities have many more rental properties. Single family homes are still available usually in the form of cluster homes. Retirement housing in Dallas TX is varied and plentiful with active adult communities, high rise condos, senior apartments for rent, condos, lofts, downtown residential complexes, villas, duplexes, and single family homes for over 55 boomers and seniors. Poplar locations for retirees in Dallas TX are in Uptown neighborhoods, Arlington, North Richland Hills, Cedar Hill, Gunter, Addison, Carrollton, Garland, Irving, Denton, Rockwall Fort Worth and others. Ideally located in the heart of Uptown, Azure has taken the idea of resort style living to whole new level. Nestled between Dallas' premier Turtle Creek and Uptown neighborhoods, The Stoneleigh Residences is set in a vibrant, eclectic pedestrian-friendly urban atmosphere. 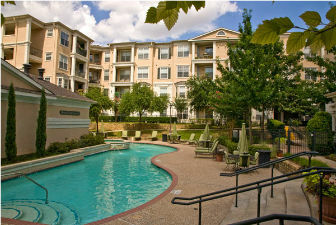 Located in Uptown within walking distance of the plenty of restaurants, the West End and Victory Park. 24 hour concierge, salt water pool 20x40 ft viewing windows. This one of a kind building is located in the Heart of State Thomas. It overlooks a seven acre park and many of the two story lofts feature incredible skyline views. This is the second high rise planned for Victory Park. The House is a 28 story tower comprised of 150 residences with interiors designed by world famous designer Philippe Starck. Many consider Dallas to be among the best retirement cities in the U.S. Here are some other reasons to choose living in Dallas. Social Opportunities: studies have shown that a good group of friends is more important to a happy retirement than money or health. Dallas offers many opportunities with civic groups and hobby clubs to generate a solid core group of friends. These friends can help ward off the problems of aging like dementia and health issues. Public Transportation: rural living isn't good for seniors who can't drive since they require someone's help to get around. The expenses of transportation add up quickly for fixed-income seniors so the public transportation of Dallas is quite beneficial. Even better is that most public transit systems have senior rates that are much cheaper than normal. Access to Medical Services: it's pretty obvious that if you live near a hospital, you're more likely to survive a medical emergency. Despite how your mind feels, the body starts to break down and there's a good chance you'll need a hospital visit during your retirement years. Living in Dallas is great since there are more specialists and medical services available and at cheaper rates. Access to Local Businesses: city living offers walking distance to most businesses that you'll ever use in your retirement years. Even if you need to travel, there are a lot more shopping centers and discount stores in urban areas. Fitness: exercise is critical to keeping healthy during your retirement years. Cities have every type of fitness facility from standard fitness centers to niche fitness places like indoor rock climbing walls so there's something for everyone. Even if you want to exercise on your own, there's tons of parks or indoor malls to enjoy walking in. Continuing Education: today’s seniors know the importance of exercising their brains, as well as their bodies. Urban living provides access to a wide range of classes, through local universities, museums, city recreation departments, etc. Enrolling in these types of courses can help stave off the depression that some people feel once they stop working full time. Food and Entertainment: retirement should be full of activities you never had a chance to enjoy while working. Dinners out to fancy restaurants or weekend getaways to a nearby city or historical site are all possible living in a city. Usually, cities have tons of entertainment venues like theaters and museums and there's always something going on.